Mike Davis presented a check to Kaytlen Matthews in the amount of $1,000.00 on behalf of The Robbie Davis Memorial Foundation. 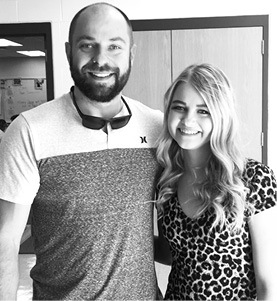 Kaytlen is a senior at Clinton County High School and will be attending the HOSA International Leadership Conference in June, 2019 in Orlando, Florida at Disney’s Coronado Springs Resort. In addition, four other students, Haley Lowhorn, Tristan Moons, Victoria Franklin, and Kaylee Stearns, will be representing Clinton County and Kentucky at the international leadership conference. The cost per student to attend is $1,100.00 each. If you or your company would be willing to sponsor one of these students please call (606) 387-6448.